This book reminds me of Blade Runner 1982. It is the future, and while the world has changed, crime has not. When an influential lawyer is brutally murdered at the top of the Beanstalk, a towering exo-atmospheric elevator serving as Earth's hub of interplanetary trade, Detective Rick Harrison reluctantly accepts the case. Harrison's investigation soon leads him from the sprawling megapolis of New Angeles to the distant moon base of Heinlein, where he searches for clues amongst an uncooperative assortment of bioroids, clones, and disgruntled human laborers. But Harrison quickly finds himself at the center of an ever-deepening conspiracy, and is faced with the one question he never expected: What is the true definition of humanity? 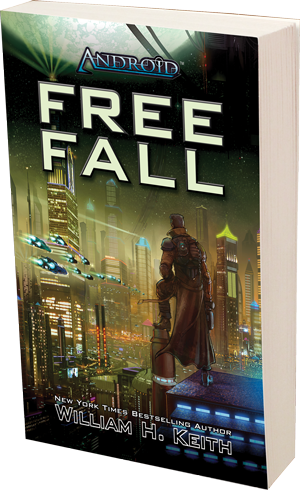 Free Fall is the first novel based on Fantasy Flight Games's Android, conveying a dystopian world of technology and corruption. This rich universe is masterfully brought to life by New York Times Bestselling author William H. Keith, winner of the H.G. Wells Award and multiple Origins awards, and the celebrated author of over 150 novels, short stories, and other published works.